PHILIPPINE SEA – The U.S. Navy has hospital corpsmen on all of its vessels to treat the crew if any medical emergency, injury or illness occurs. The Ticonderoga-class guided-missile cruiser USS Chancellorsville (CG 62) is no different. In honor of the rating, Chancellorsville held a cake-cutting ceremony, June 17, to celebrate the 120th birthday of the hospital corpsman. The Hospital Corps did not become official until June 17th, 1898. Now, the Hospital Corps is the most decorated branch of the U.S. Navy with 22 Medal of Honor recipients. Hospital Corpsman 3rd Class Jenson Gabriel Yalunggonzales, from Long Beach, California, is a hospital corpsman aboard Chancellorsville. He can often be found working in medical or on the flight deck during flight quarters ensuring the crew’s safety. Before the Navy, Yalunggonzales said that he knew he wanted to help people. He was conflicted with two options of either joining the military or going to school and becoming a nurse. After joining the Navy, Yalunggonzales said that the Navy gave him a sense of purpose and drive. Everything he does while being in the Navy is to better himself. He does not do it just for himself, but for his family. Being a hospital corpsman has also helped him progress to who he wants to be in his family’s eyes: a role model figure. ales said during his time as a corpsman he has found sometimes it is more than just knowing how to treat someone, but simply just being there for them. “You can give a smile, be a buddy or simply be someone that can listen,” Yalunggonzales said. “That’s what really helps people out. I don’t know how many times I’ve had somebody come to me . . . all they wanted to do was sit and vent to somebody or they just wanted to listen to a song. By the end of it, all they’re saying is thank you for giving me that and being there. That’s my core job. 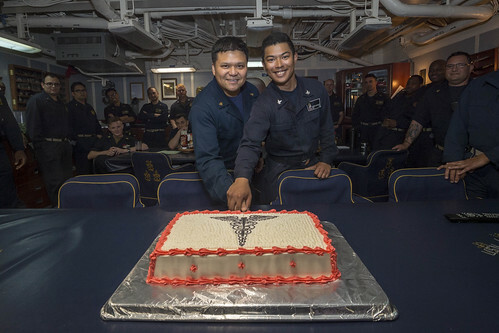 I’m here for the crew, for their mental and physical health.” Coincidentally, Yalunggonzales joined the Navy four years ago, June 16, a day before the hospital corpsman’s birthday. He said when he realized the days were so close, it made celebrating his Navy birthday and his rate’s birthday even more personal to him. “Corpsmen have always been one of the closest knit rates in the Navy,” Yalunggonzales said. “I take that especially true, because from my last command to this command, all of my ‘Docs’ and ‘Baby Docs’ are like my [family]. It’s special. We’re the greatest rate in the Navy, so being able to celebrate my rate’s birthday with my Navy birthday, makes it so much better.” Chancellorsville is forward-deployed to the U.S. 7th Fleet area of operations in support of security and stability in the Indo-Pacific region.